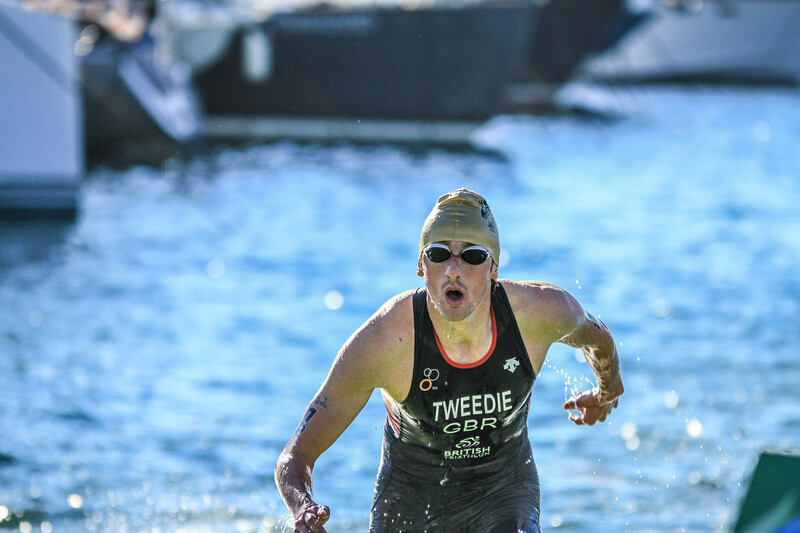 Many years ago, the swim/run event was more of a sideshow at a major event but over the years, more and more athletes have tested themselves, challenged others and delighted the crowds with stunning performances and sure enough, for a good few years now we have seen increasing numbers of Elite, U23, Junior, Para and of course Age Group athletes taking the challenge as either a standalone event or now, as part of the multisport festival, as an additional event and medal-wining opportunity. 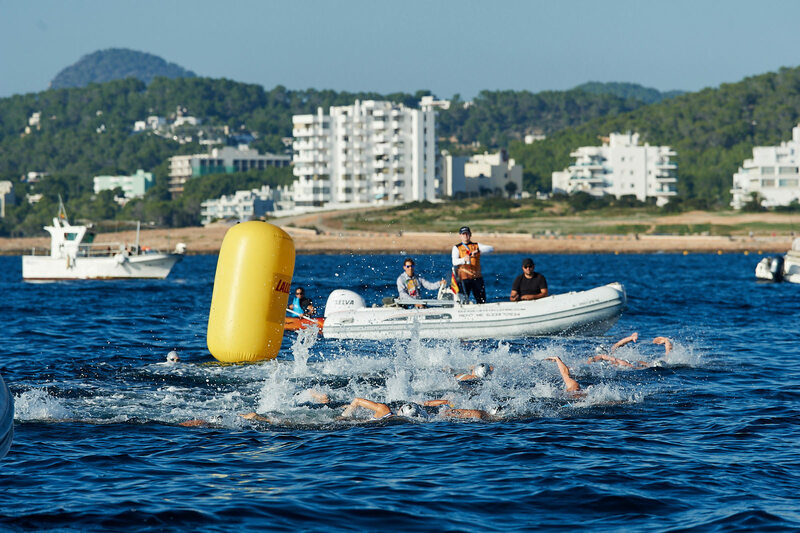 This year, as part of the Ibiza Multisport Festival, the event provided a brief respite from the tough bike courses that the organisers had created and with this event not even starting on dry land. 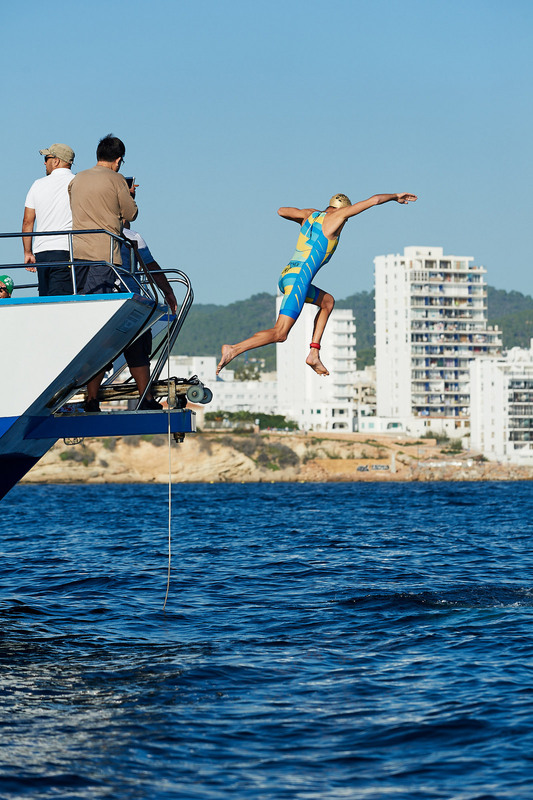 It was certainly a memorable start for the many athletes but also a logistical challenge that the Organisers met full on and with impressive delivery. This event saw the women’s start a mix of Elite, U23 and Juniors. Nobody could have predicted the result that saw the junior and U23 athletes pretty much dominate the race. 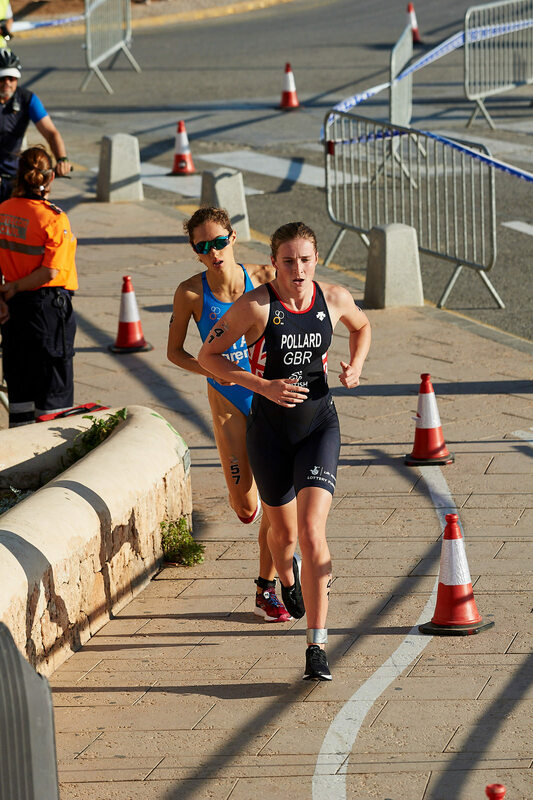 From the very start, it was a shock for the elite, with Britain’s Chloe Pollard leading them out of the water in 12:39, just ahead of Maryna Kyryk UKR. 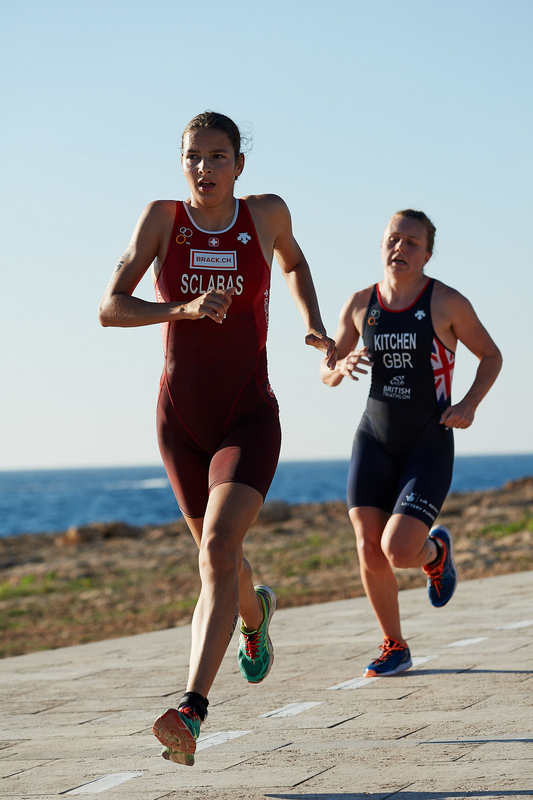 This lead pair were just a couple of paces ahead of Italy’s promising young junior, Bianca Seregni and these three were comfortably ahead of Hannah Kitchen, double ETU title-holder, defending champion and runner up in Fyn at the Worlds. 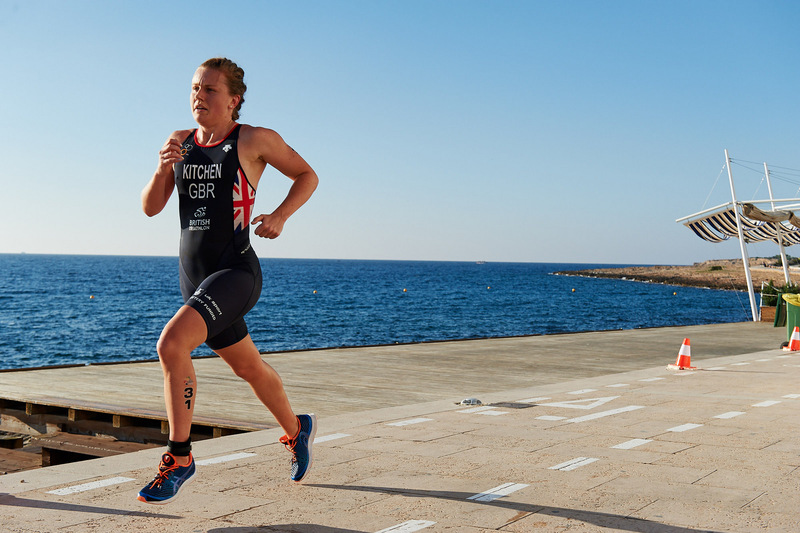 Kitchen might not even have made it to the start following a car crash only days before the race but with great determination, she turned up to do her duty and this was certainly not the start to the race that she wanted but possibly one she expected. Despite the pain she dug deep and soon had caught first Kyryk and then teammate Pollard but there was no way she could eat into the lead that Seregni was creating. Still in with a chance and running well, Kitchen was caught by Romania’s U23 star, Antoanela Manac. Next to pass her was Delia Sclabas SUI, who came to this event with the 2017 World Junior title and as runner-up in the Elite race. She had shown great pace earlier in the week, with her final run blowing apart the lead. With this mixture of talent and with Kitchen’s injury, it was a pretty astonishing finish, with Seregni taking the title and with Sclabas easily outpacing Manac. Both these athletes are much stronger than the Swiss junior but her pace was just amazing and with a bit of work over the winter months, the Swiss Federation will have an athlete who can challenge anyone. So, Elite medals went to two juniors and a U23 athlete. 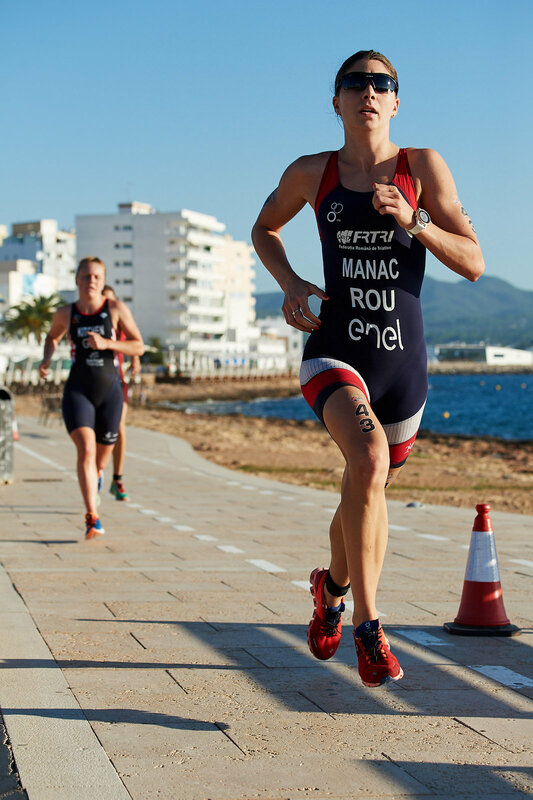 The U23 medals were topped by Manac, who closed her Multisport challenge with a full set of metal by taking the silver in the U23 Cross Triathlon. 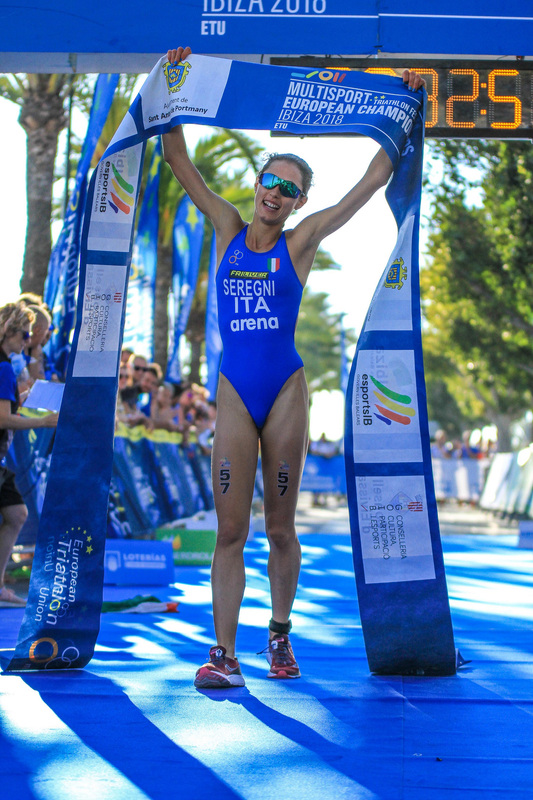 Ukraine’s Sofiya Pryyma was unlucky to have lost out, having exited the water ahead of Manac and despite running hard, she could not catch the Romanian, missing the title by just a few seconds. She returned to Ukraine and the winter snows, with a silver from this event to add to her U23 title from the Cross Triathlon and an elite bronze in that event. The U23 podium was rounded off by France’s Céline Senia. 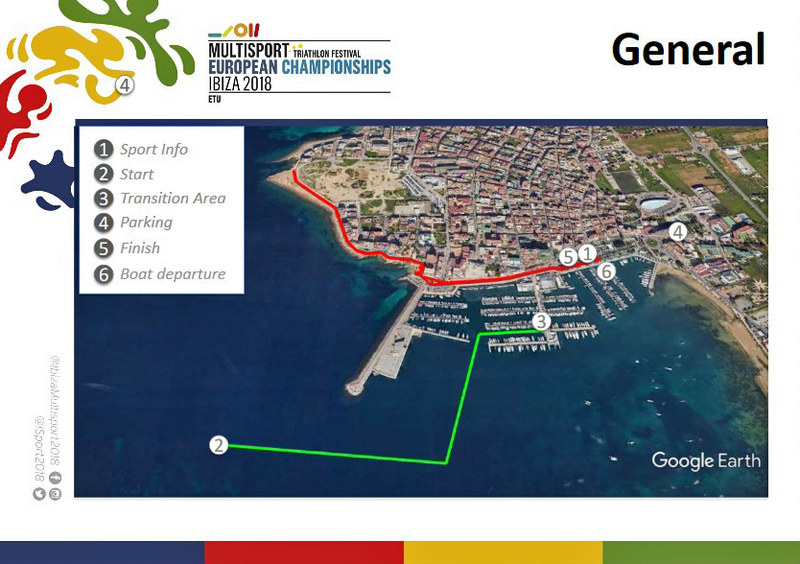 For the juniors, it was Seregni adding Junior Gold to her Elite medal, with Sclabas in silver and a great result for the Swedes, with Ida Lucia Burrows, one of the younger athletes in the race, coming home with a bronze. 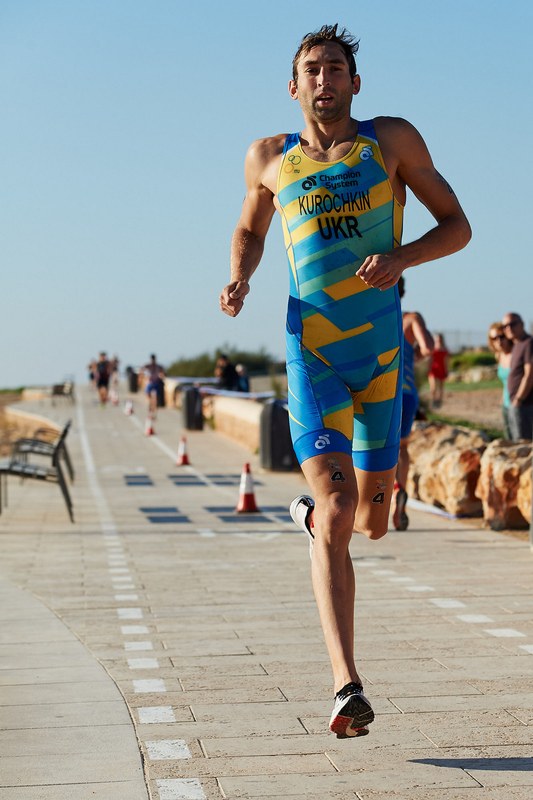 The footballing, swimming, Maidenhead-based athlete has also raced under the GB flag but now sees success, wearing Swedish colours. For the Elite Men’s race, it was again the younger athletes who set the initial pace. 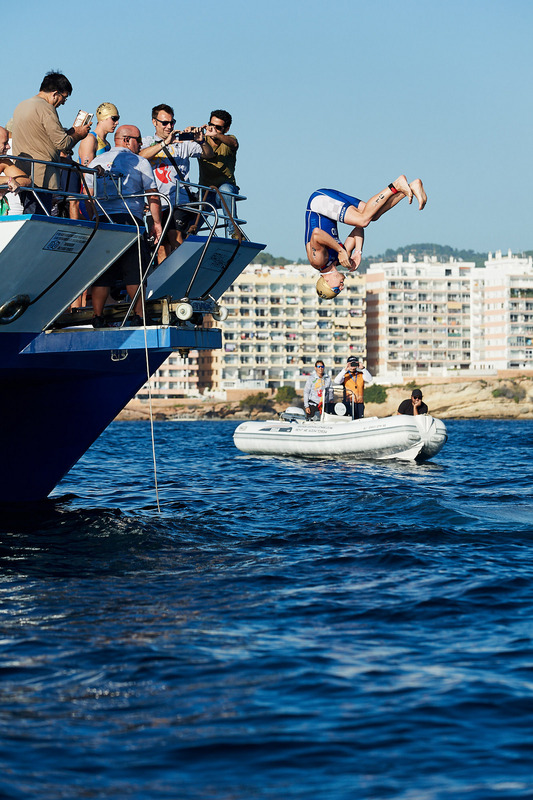 From the deep water start, it was Great Britain’s Nathan Tweedie who led. He was followed by team-mate Sam Dickinson, Hennadii Anzin and Šimon Koblížek. 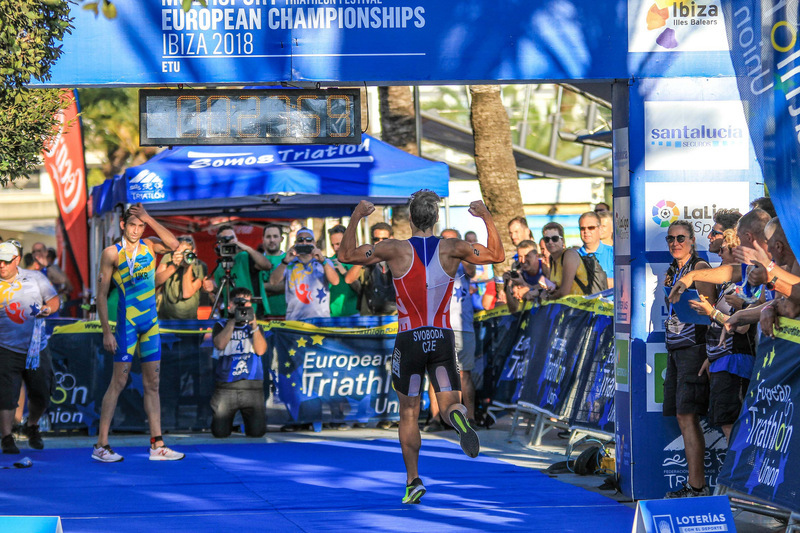 With defending ETU Champion, Richard Varga at home with his wife and their newly-born baby, the title was up for grabs and it looked as if the youngsters would upset the record books in this race too. Having placed 4th last year in Bratislava, Ukraine’s Sergiy Kurochkin was just a few paces behind the leaders and, fired up after losing more time in transition, he set off on the run knowing that he had the pace to catch the lead group. He dug deep and soon enough was able to catch up and one by one to pass the leaders until he was in pole position. His blue and yellow uniform was the ideal target to focus upon for the Czech Republic’s Tomáš Svoboda, who had won this title back in 2015 in Cologne. The pair surged ahead to the front and it was only Dickinson who could keep a grip on the last podium place, with his run pace just that bit faster than Tweedie. Heading towards the blue carpet and it was Kurochkin had that extra kick to take the title. Gold to Ukraine, silver to the Czech Republic and bronze to Team GB in the Elite. For the U23, the Brits claimed the top two places, with Dylan Magnien winning bronze. The Junior Men’s race saw the medals won within a ten second window. The early leaders, Hennadii Anzin and Šimon Koblížek had Marek Pavuk for company but the fast running from Croatia’s Luka Grgorinić soon shattered any dream of victory. His winning time of 29:01, was just 4 seconds ahead of Anzin, with Pavuk coming home in 29:11. Watch out in future for Ukraine’s Vitalii Vorontsov. His silver medal in the duathlon was exciting to watch. His 16:59 run here in the Aquathlon was 3rd fastest of the day. 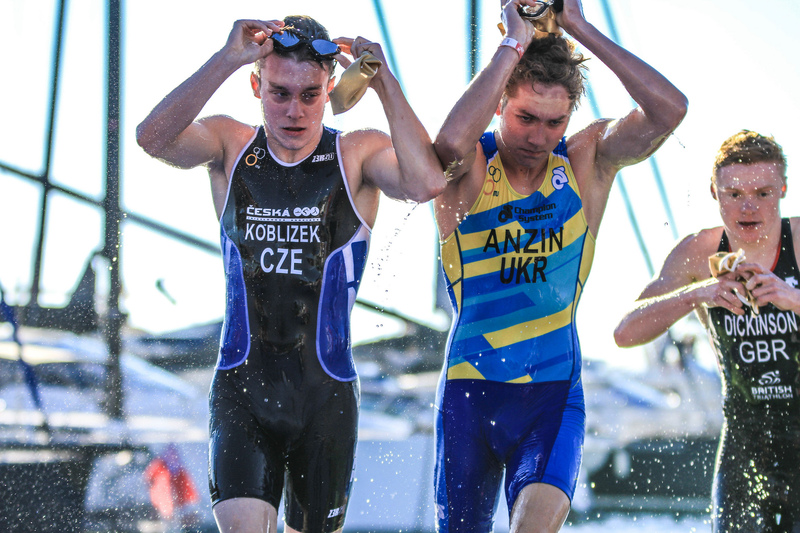 Again, a bit of focus over the winter months and we will see another young athlete racing the ETU circuit with amazing finishing strength. 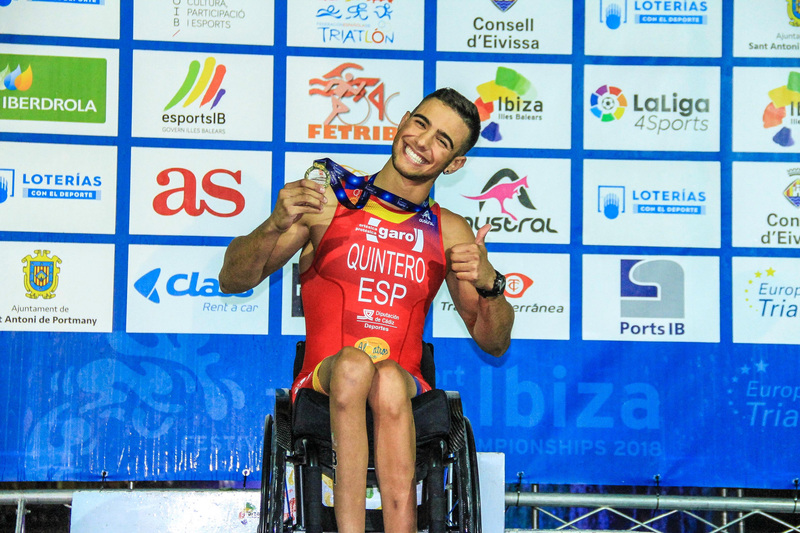 For the Paras, there were medals for Spain and Italy, with races in the PTWC, PTS2, PTS3, PTS4, PTS5 and PTVI categories. For the two stunning albums provided by the LOC, please click here and here.